"Head of department Milan Lazić regularly represents multinationals and local government clients in international arbitration. He has noteworthy expertise in commercial, labour and M&A disputes." Milan is a Senior Partner the head of our regional Arbitration and Litigation Practice. With over 10 years of professional experience, he has represented clients in a number of high profile international court cases as well as in a number of major international arbitration cases of before the ICSID, ICC and UNCITRAL arbitrations, as well as arbitrations before the local Foreign Trade Court of Arbitration attached to the Serbian Chamber of Commerce. 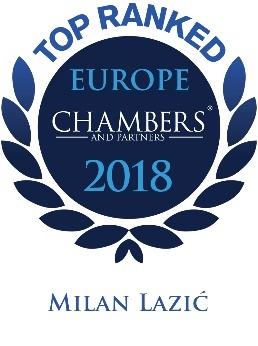 Milan advises clients over many industries and is highly experienced in international and domestic corporate and commercial litigation, disputes and services. He advises large corporates and international and domestic public institutions.